Posted on January 24, 2014 by Caleb McDaniel | Comments Off on Virtual Class! Put another way, digital history means that a snow day freezing rain day doesn’t have to interfere with our discussion of the assigned readings! In fact, not having our face-to-face meeting today gives you a chance to try out your developing Twitter chops. I’ve posted several tweets to the #ricedh hashtag that pose questions about the readings. All of them have to do with the balance of “cost” and “benefit” that historians have to weigh when digitizing sources like runaway slave ads. Based on the readings, what do you see as the major costs of digitizing sources? The major benefits? 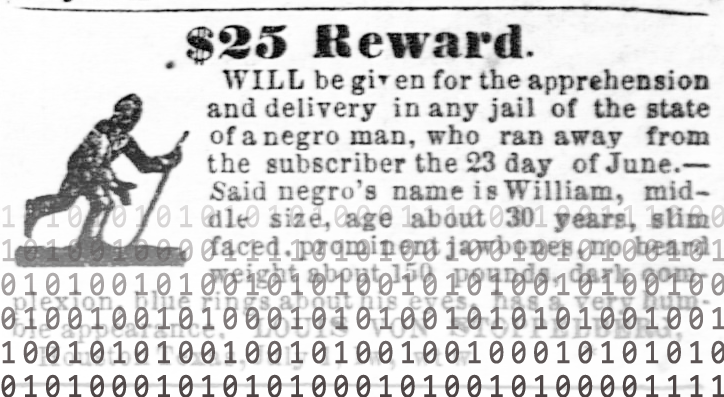 What would be gained by “marking up” the text of fugitive slave ads like we did for Homework #1? What would be lost? If pressed, how would you answer the question of what “digital history” is? A “method”? A “medium”? Something else? With your extra free time today, please use Twitter to respond to at least one of these tweets, or tweet a question or comment of your own about the readings. If you need more space to answer the questions, you can also use the comment box on this blog post to write out your answer. This isn’t a full-blown essay assignment; just make the kinds of comments you normally would if we were having class face-to-face. And keep a look out on the blog for a post about Homework #2, which will still be due on Wednesday.